…for the woman who inspires herself. A few weeks back I took a little trip down to Birmingham for the day to see an exhibition that was showing there. Having only ever been to Birmingham to change trains at the station, I was pretty excited to finally take a trip there and see what it was like in the city itself. It occurred to me that this might be something that you’d be interested in reading so I’ve put together a post about the places that I visited when I went. This was such a weird coincidence visiting here. Basically what had happened was that I’d read a few different posts about visiting Birmingham before I visited (as most of us do!). Despite having a read through some blogs, I didn’t note don any information about the places and just decided I’d do my own thing when I got there. As I was walking around I stumbled across a cafe called York’s and it wasn’t until I got home that day that I realised that I’d actually read about York’s in a blog post! Anyway, onto the actual cafe itself… Located just by Birmingham New Street Station, York’s seems to be a bit of a chain in Birmingham with a few branches around the city. I treated myself to a chocolate and peanut cookie and an elderflower pressé. Although I’m a huge coffee lover I’d already had a coffee that morning so I wanted to shake it up a bit. There were so many different options of freshly baked snacks on display that I so could have easily eaten about 5 things. However, I contained myself and went with the cookie. Honestly it was one of the nicest I’ve ever had. If you’re heading into Birmingham then York’s is a definite must visit! The entire purpose behind the trip to Birmingham was to visit an exhibition that was on at the IKON Gallery. Little did I know how lovely the gallery itself was going to be until I actually got there! As much as I loved Haroon Mirza’s art I ended up taking photos of the gallery’s entrance sign as well! How can you not? One of my 5 goals for the new year was to immerse myself in more culture. This was definitely a great way to get started on it! If you happen to find yourself with a free day in Birmingham then it’s worthwhile checking out Haroon Mirza’s exhibition over at the IKON. It’s open Tuesday – Sunday and it’s free so get yourself there! I have to admit The Custard Factory was not what I expected at all. In my mind it was going to be something that would rival Liverpool’s Baltic Triangle but in reality it seemed to be tiny in comparison. Maybe I didn’t fully explore all that it had to offer or I overlooked some hidden gems while I was there (Birmingham bloggers, let me know!). However there were a few little places that really interested me within the area. The first was Sara Preisler, a jewellery and craft shop in the centre of the area. If you know anything about me from reading my blog I’m guessing it’d be that I LOVE a bit of jewellery. So, of course I popped in for a look around. As obsessed as I am with jewellery I actually found myself drawn to the ceramics at Sara Preisler. I spent a period of time working with ceramics and glass when I was studying in college a few years back. Now whenever I see glass work I’m instantly fascinated by it. It’s definitely something that I’d love to return to someday. Who knows, maybe I’ll get back into it after university. A few doors down from Sara Preisler was The Clean Kilo. 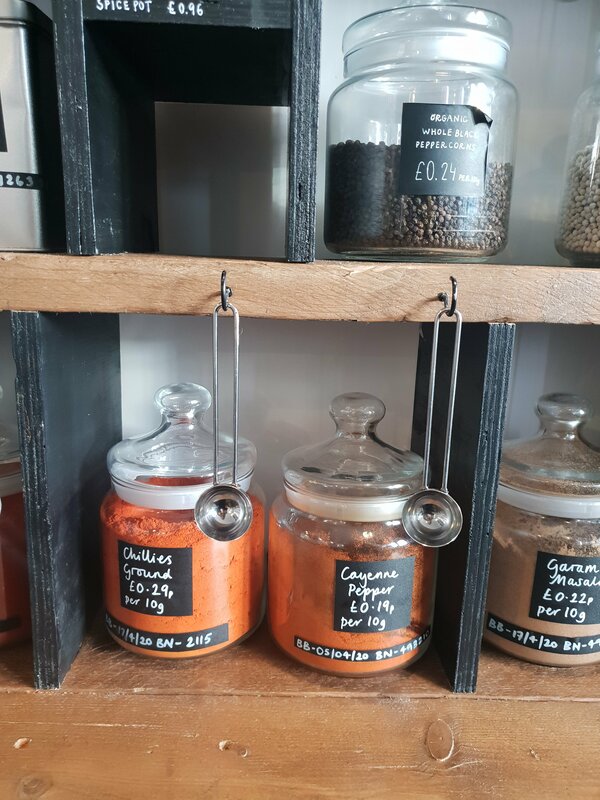 As the biggest zero waste supermarket in Birmingham, The Clean Kilo is a must visit. I’ve always been someone who appreciates fresh produce and loves cooking their own meals. So, when I cam across The Clean Kilo I was super interested to see what they had in stock. The fact that they’re a zero wast supermarket was a huge bonus! I have to admit that I didn’t actually go inside the gallery. I did however have a photo shoot in front of the gorgeous sculpture of a lion above the doorway to the gallery. As a Leo, it only made sense to get a photo in front of it! I love how completely fascinated with the lion I look in the first photo. Can you tell that it was a bit cold that day…? (haha!). Is it even a day out until you have a fruity beer? I think not! Having a Brewdog located just near the station made for a perfect end to the day. I’m certainly no stranger to a Brewdog and the Liverpool one is a regular spot of mine when I’m home. I’ve never been much of a beer drinker but add a fruity flavour to it and I’m sold. Sadly my favourite, Framboise, wasn’t on the menu but I found a substitute which was a close second. Whenever I drink a Framboise I’m always reminded of my trip to Malaga in the summer for my 21st. It was something that I’d drink almost every evening while I was there and just brings back great memories. Have any of you visited Birmingham before? Maybe you’re even from there yourself! Let me know what your favourite places to visit are. I have no doubt that I’ll be returning soon to see what else the city has to offer. 7 hours isn’t exactly enough time to explore the second biggest city in the UK but I think I did an okay job! What do you think of this as a potential series to move forward with on the blog? Is there anywhere else that you’d like to see a “7 (…ish) hours in” post about? Let me know! I’m glad you had a fun day! I live near Birmingham and even I seem to find something new every time I go! It’s pretty vibrant city. You’ll have to visit at Christmas one year for the markets! Oh that looks so nice. I have to put it on my list of places to travel to. I wish we had a no waste supermarket in my town. I hate having all that plastic wrapped around my food. Looks like you managed to squeeze quite a lot into 7 hours! How convinient that the Brewdog was close to the train station…I would have been in there as well. I have only ever been to Birminghma once to see Maroon 5 at the NEC Birmingham. I can’t remember much of the city, but the Bullring shopping place is massive! Hi there! That looks like a great 7 hours! The no waste supermarket is such a great concept, I wish there were more of those everywhere! Thanks for sharing! OOOHHH!!! This is giving me serious FOMO! ha! I love your pictures – it definitely makes me want to visit one day! I’ve actually never been to Birmingham but I would love to! That glasswork looks so beautiful! Birmingham sounds really interesting – I wish I had the chance to visit when I lived in England! 2019 © Female Original Crafted with love by SiteOrigin.